On 25 June 2013, the Ss Cyril and Methodius Jubilee Readings opened at the All-Russia State Library for Foreign Literature. The Readings are sponsored by the Ss Cyril and Methodius Theological Institute of Post-Graduate and Doctoral Studies and the All-Russia State Library for Foreign Literature with support of ‘Meta’ Education Centre. Among those taking part in the meeting were archimandrite Teoctist (Dimitrov), representative of the Patriarch of Bulgaria to the Patriarch of Moscow and All Russia and rector of the Bulgarian metochion in Moscow; faculty and student of the Ss Cyril and Methodius Theological Institute; Slavonic scholars from Russia and from abroad. 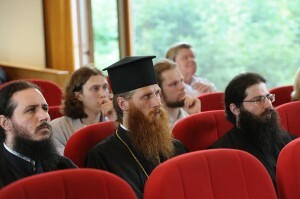 Metropolitan Hilarion of Volokolamsk, chairman of the Moscow Patriarchate’s Department for External Church Relations, chairman of the Synodal Biblical and Theological Commission and rector of the Ss Cyril and Methodius Theological Institute of Post-Graduate and Doctoral Studies delivered a report on the ‘Education labours of Ss Cyril and Methodius as a living church tradition’ at the opening session. Greeting the participants also were Yekaterina Genieva, director of the Library for Foreign Literature; H. E. Wojciech Zajączkowski, Ambassador of Poland to Russia; H. E. Slavenko Terzić, Ambassador of Serbia to Russia; Mr. Taras Malyshevsky, counsellor of the Embassy of Ukraine; Ms Vasilka Kejhanova, first secretary of the Embassy of Bulgaria; and Ms Giovanna Parravicini, cultural attaché of the Embassy of Vatican to Russia.